Happy Mother's Day! What's Mother's Day without cute, cuddly things? I have a weak spot for cute things, brown bears being one of them. I had been looking forward to Disneynature Bears before my husband even heard about it. So when he excitedly pointed out a trailer on TV because of the cubs irresistible cuteness, I had to say, "I already know about it, love." Bwahaha! Disneynature Bears is the 5th release from Disneynature and in brief, it showcases a year in the life of a bear family. Follow along as two young cubs are taught life’s most important lessons in Alaska. Yep, this post definitely starts with an adorable video of a baby bear digging up clams. What would we do without our moms? Well, as a tribute to moms this year, Disney Movies Anywhere (DMA) is offering everyone a FREE Digital Copy of The Incredibles. All you have to do is connect your iTunes account with the DMA app. By the way, Incredibles is AWESOME! Plus, save $5 off each on Brave, Tangled and Mary Poppins! DMA is an easy way to buy, watch and manage movies digitally. It's a cloud-based technology that allows access from the DMA app via various devices. Now for some Mother's Day wishes from another one of my favorites, Monsters University! Moms are pretty important and they do a ton too. 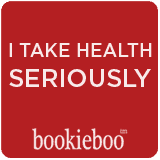 I saw that calls for some rest and relaxation, perhaps some pampering? 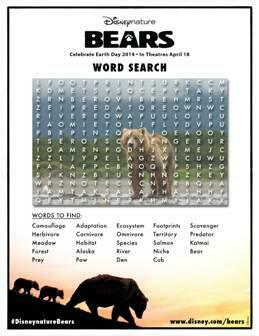 Here are some fun Disneynature Bears Activity sheets to keep the kids busy so you can have a moment to yourself. Click the image to download. Teehee, and of course a funny trailer to end off with! 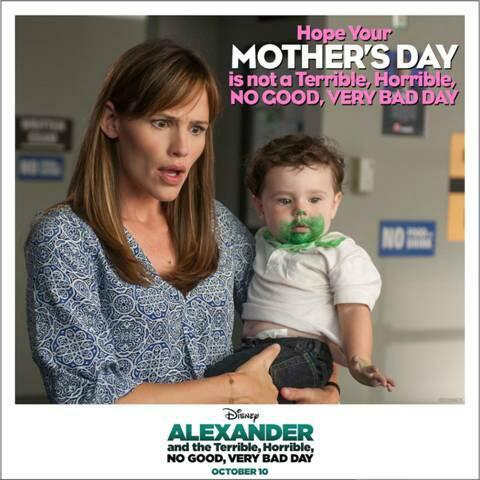 Check out this Alexander and the Terrible, Horrible, No Good, Very Bad Day trailer, opening in theatres everywhere on October 10th. And it gets props because it mentions Wreck-It Ralph, besides being hilarious and heartwarming!